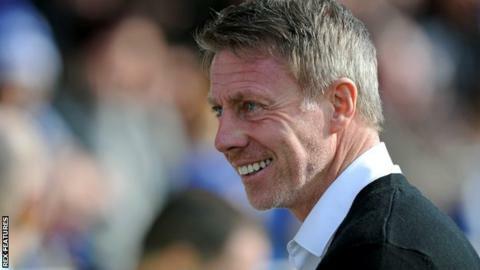 Hartlepool United have won eight of Craig Hignett's 16 games in charge. Hartlepool United manager Craig Hignett says their unbeaten home record shows Victoria Park is an awkward place for away sides to play. Pools have lost just once at home since Feburary and have taken points off top-half teams, including a win against AFC Wimbledon and a draw with Northampton. "I am pleased with what the lads are trying to do and how they are going about it," Hignett told BBC Tees. "We want to make it a difficult place. We're proving that at the minute." Hartlepool now sit in 16th place with 51 points and have confirmed their fourth-tier status having pulled away from the bottom two thanks to a seven-game unbeaten run during March. "If someone said to me that we would have at least 50 points by the time the season finishes, I would have been delighted by that," he continued. "Looking back at the situation we were in in my first game, to the situation four or five games ago when I thought we were safe, it's phenomenal. The credit has got to go to the players because they are the ones who have done it." The club have been boosted by the form of midfielder Nathan Thomas, who has scored four goals in his last four games. "He's a real menace, I want him to do that for 90 minutes, if we get 40 or 50 minutes out of him, that's not good enough, I want him to go again. The lad's got so much ability and so much talent, I think sometimes he doesn't realise what he's got."